An artisan guild that helped to shape the California Arts and Crafts movement. Textiles were an important part of period bungalows. An ode to the Gamble House by a homeowner/craftsman. The architect who left an Arts and Crafts design legacy second to none. 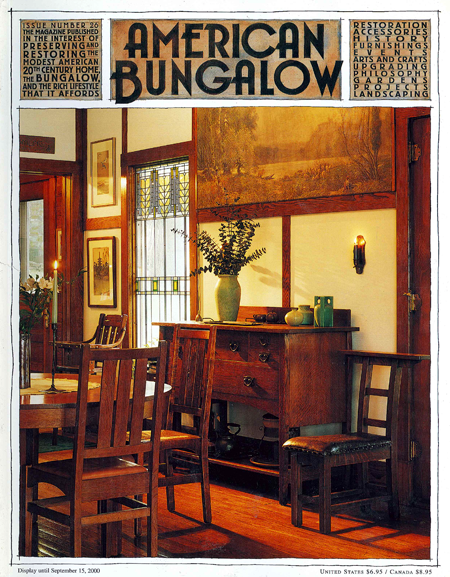 A wonderful collection of Roycroft and Stickley furniture in a New York State Bungalow. Sites worth exploring on your next Canadian jaunt. Unearthing a bungalow’s original architectural details. This issue’s topic: matte green art pottery. Stephen Kaniewski brings an enthusiasm for lighting to Milwaukee and beyond. A new feature on collecting: Installment I — Morris chairs. Remembering when the kitchen was the heart of the home.